Standing still and enjoying the moment are two actions Stella has struggled with since she was a child. To pass the time, Stella kept herself busy. She figured she could accomplish anything as long as she kept her eye on the clock. Turning from task to task was just part and parcel to Stella’s life. Her kinetic energy fueled her schedule. She worked two jobs during college. She kept fit by incorporating exercise into her routine. She walked or rode her bike to and from every shift, class, and social event. When she moved from the seaside to the desert, she simply traded her mountain bike for an elliptical machine. Eventually, as the years passed, she married, and her family grew. Stella’s schedule provided less time for personal fitness and more time for the needs of others. She found that her schedule ran smoothly as long as she skipped one particular task as often as possible—preparing a full meal. To wit, she served tasteless food quickly. For Stella, cooking was one task that needed fewer details. Stepping through recipes and fiddling with fancy cookware was a burden. She liked to limit the time necessary from recipe to result. Preparations were best limited to rinsing the meat, rice, and vegetables before throwing it all into a pot with herbs, garlic and a glass of water. If a meal might take more than 30 minutes to cook, Stella considered options for takeout. Timing was everything. Like any mother with a family and a full-time job, Stella found herself running from sun up to sundown. She stressed daily with dressing the kids, checking their teeth and bags, taking them to school, racing to the office, and processing words. As time rounded, her stress expanded for picking the boys up, fixing dinner, unpacking bags, washing clothes, and checking teeth before she slumped in to bed before the next day’s marathon. Only on Sundays did she finally relax and refocus her energies. She found escape from her regular reality by filling up her day with someone else’s drama through TV, books, music, or art. Stella loved Sundays. This particular Sunday she found herself gazing across her desk only to spot an old cookbook. Not the slick, spiral-bound booklet listing with over 100 ways to grill meat. No, what Stella glared at was a classical culinary collection known the country over to most women of a certain age. For the next 30 minutes, Stella listened to the myriad of meals prepared and activities accomplished by her parents during the past week. Upon hanging up, she considered herself fortunate. Stella realized time should be savored and not simply passed. Appreciating time all the more, Stella reached for the cookbook and opened to the recipe for joy. Sunday, August 11, 2013. ©2013 Stephanie Abbott. All rights reserved. 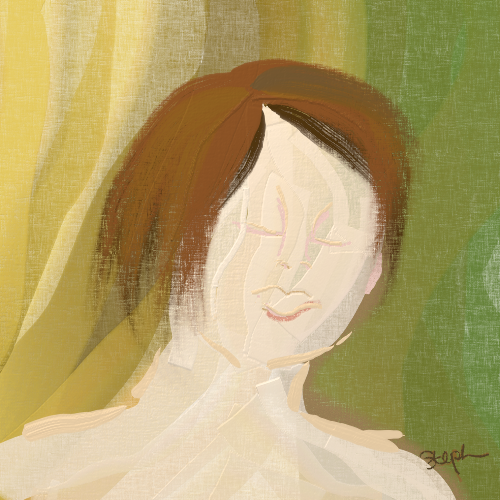 I created the picture of Stella this morning on my laptop using ArtRage 4 and my new Wacom pen tablet. I wrote the story last night. I have not written creatively for some time. My writing has been restricted to tapping out basic business bother. By the time I get home from work, my head hurts and my body aches too much to be creative. However, after an entire season (or two!) of the doldrums, I’m ready to stretch and start creating again. Thanks for visiting and commenting, Ramana! Interesting quote. I’m afraid I’m not very familiar with Sylvia Plath’s writing. I have guts to write. Lately I’ve lacked the energy to create with any regular frequency. I’ve got to get back into the habit of creating daily or weekly. A test comment. My apologies for doing that as WP occasionally does funny things.